Op-Toons: Supreme Court Justices Call Police on Raucous White House Party: "We're Trying to Get Some Work Done Over Here!" Supreme Court Justices Call Police on Raucous White House Party: "We're Trying to Get Some Work Done Over Here!" 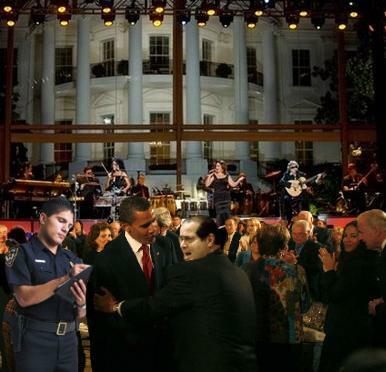 Washington, D.C.--Police narrowly averted a constitutional crisis last night by shutting down the latest of many parties at the White House after U.S. Supreme Court Justice Antonin Scalia called and complained "We can't get any work done with all that racket!" Scalia and other justices said that after a Super Bowl shindig, several lawn parties, music concerts, and conga lines, "enough was enough." "They have the gall to commit all manner of constitutional violations," said Justice Alito, "and then on top of that they carry on with raucous celebrations well into the night so we can barely hear ourselves think, let alone write opinions describing all their constitutional infractions." Administration officials poo-poohed the Justices as "cranky old men," saying "They wouldn't have such a sour attitude if they believed in living a little -- and in a living Constitution that changes with political trends."